One of the year’s biggest events for the watchmaking industry, SIHH 2018 kicked off today in Geneva, and we’ve already got an exclusive piece of news to share: Richard Mille is launching an all-new RM53-01 Tourbillon Pablo Mac Donough, a polo watch which will be limited to only 30 pieces. Favoured by aristocrats throughout history, polo is an incredibly elegant but also extremely competitive sport that requires full strength, precision, speed and serenity from its players. It’s rather dangerous, too, as it’s a contact sport that includes some hard knocks that can lead to injuries — hardly the ideal environment for wearing a fine timepiece. That’s exactly the case for Pablo Mac Donough, one of the best polo players in the world, who’s sustained a large number of fractures in the course of his career. To tackle the problem, Swiss watchmaker Richard Mille took up the near-impossible challenge of creating a watch that he can wear, even during one of his games. The result? An all-new RM53-01 Tourbillon Pablo Mac Donough. As a tribute to Pablo Mac Donough, one the world’s best polo players, Richard Mille developed a new tourbillon that can resist all types of shock that arise at a polo match. Unlike the RM 053 from 2012, this brand new RM53-01 features a design that’s sporty and dynamic. It’s also equipped with a highly innovative, suspended tourbillon calibre, which can be seen through the unprecedented laminated sapphire glass specially developed — in collaboration with Stettler, a world-renowned sapphire specialist — to resist all shocks that arise during a polo match whilst leaving the movement visible — nothing short of a technological feat. The first of its kind in the horological world, this special glass is a patent-pending Richard Mille exclusive, and consists of two sheets of sapphire glass separated by a thin Polyvinyl film. Whenever a strong shockwave occurs, such as a blow from a mallet, the glass will crack, like a car’s windscreen, but never ever shatter. To further shield the movement completely from all external risks, the glass has also been treated with anti-reflective and UV coatings. The tripartite case, meanwhile, is machined in Carbon TPT®, and is also punctuated by notches to reinforce its structural integrity. This special material is not only seriously tough, it’s also highly recognised for its excellent resistance to micro-cracks and tears, providing a virtually indestructible protection during this high-risk sport. Thanks to two Nitrile O-rings, the complete case construction is also water-resistant to 50 metres, and is assembled using 20 spline screws in grade 5 titanium and 316L stainless steel washers. 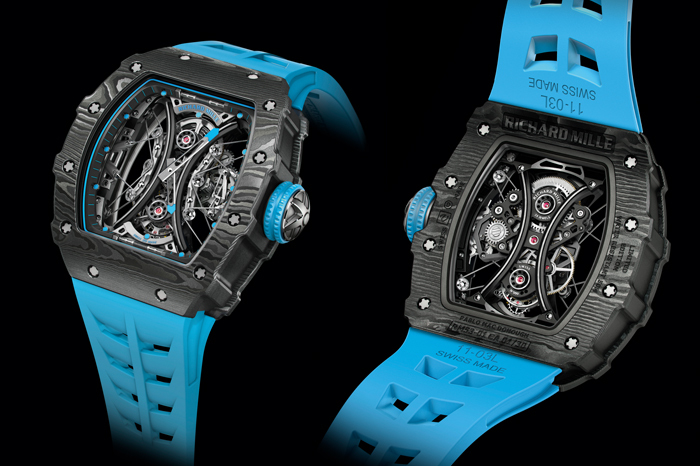 The new RM53-01 Tourbillon Pablo Mac Donough by Richard Mille. With shock being one of the ultimate enemies of a tourbillon movement, Richard Mille decided to take a further step of protection by designing a movement with a cable-suspension mechanism. It features an atypical architecture that consists of two separate baseplates — the peripheral plate and the central plate — linked together by two 0.27mm cables with the help of a tackle pulley system comprising 10 pulleys and 4 tensioners. The tension can be increased by tightening a spline screw located at the centre of each tensioner, while the pulleys ensure that the tension of the cable remains constant to make sure the whole mechanism remains perfectly balanced. As a result, the calibre RM53-01 can withstand shocks exceeding an impressive 5,000 g’s.